There's a persistent myth in the world of first aid that slapping a choking victim on the back is dangerous. The rationale is that doing so supposedly drives food or another obstruction deeper into the airway. 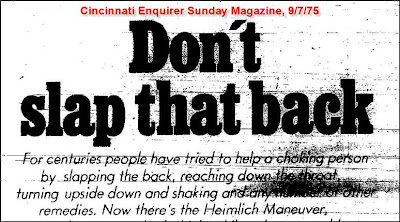 A year after he introduced "the Heimlich maneuver" in 1974, my father began making this claim. He didn't have any evidence, but for the next 30 years, he kept saying it and the media kept reporting it. Here's the first published example of which I'm aware, a feature by Irene Wright, who, according to Amazon.com, "was a reporter for 25 years with The Cincinnati Enquirer and the newspaper's first female bureau chief." The efforts to circulate and codify this baloney by my father and a few cronies - one of whom was the US Surgeon General - were successful, at least for a couple of decades. I grew up with the belief that back slaps were verboten - the First Aid equivalent of hitting a drowning man on the head with a cement life preserver. Nope, said American Red Cross spokeswoman Pamela King: Back slaps were always part of the protocol - in Europe. Choke me with a foie gras sandwich. They were? Then how'd they get such a bad rap over here? Their infamy seems to have been promoted by the guy whose name was not back slap. The guy whose name was (and still is - he's 87) Heimlich. 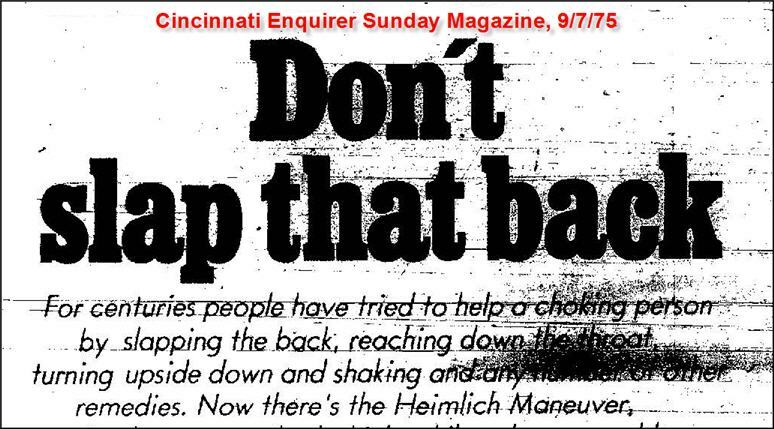 Back blows are "death blows," Heimlich declared as he lobbied for his own maneuver's acceptance 30 years ago. In 1985, Surgeon General C. Everett Koop endorsed this view, dubbing back slaps "hazardous." After that, only the Heimlich maneuver was considered kosher. What most people don't realize, said Heimlich's son, Peter Heimlich, is that "Koop was an old friend of my father's and he did it as a buddy favor." Needless to say, even after a wrong idea is righted, almost inevitably it will continue to find voice. Based on my experience, the media doesn't enjoy running corrections, but when good journalists commit errors of fact, they fix 'em pronto. So I submitted a short corrections request to news editor Brian J. Laline in which I provided documentation from the American Red Cross and American Heart Association, both of which recommend backblows as an effective treatment for choking. That seemed like sufficient evidence to make the point and I assumed he'd arrange for the paper to run a quick fix. But you know the saying about what happens when you assume. Instead of handling what should have been a simple editorial decision, Laline punted my e-mail to Ms. Larkin. And here my troubles began. Next came a string of defensive e-mails from Larkin filled with outdated and poorly-sourced information. That struck me as odd because she informed me that she's a paramedic. The first responders I've encountered in my work have unfailingly been sticklers for accuracy and keeping their skills up to date. (The) American Heart Association (AHA) continues to discourage instructors from teaching back blows. I knew this was false so I suggested she contact the AHA. I even provided her with contact information for Tagni McCrae, the organization's Communications Manager. 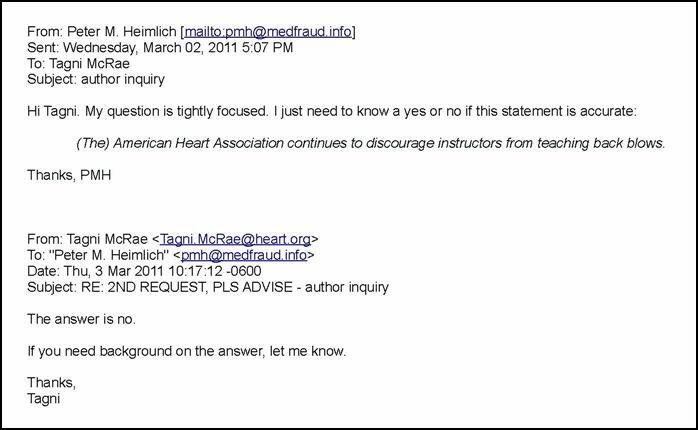 A week later, then again a week after that, I sent polite follow-up e-mails to Larkin asking if she'd contacted the AHA. I didn't receive a reply from her. Keep in mind that a month had passed since her column appeared. I then forwarded this to Larkin. She remained adamant. No correction was forthcoming. Ever seen this bumper sticker? Maybe it applies to me for spending so much of my time on this! But I'd come this far, so to close the loop, I e-mailed all the details to editor Brian Laline and re-submitted my corrections request. Is it just me or does this seem like a weaselly move? More importantly, it's unclear how refusing to correct an obvious error, then trying to clean up the record in a subsequent column, benefits readers. Much more importantly, if the Advance is unwilling to publish a correction for such a minor yet unambiguous factual error like this one, how are the big goofs being handled? Finally, I don't understand what Gail Larkin means by "if you are familiar with (backblows)" in her recent column. I mean, what kind of familiarization is required to slap someone on the back? Based on my correspondence with her, it's Ms. Larkin who needs to familiarize herself with the subjects about which she's reporting. 7/23/11 UPDATE: On July 11, while reporting this story, I e-mailed editor Brian Laline and asked if the Advance had published a correction to Larkin's error. (I couldn't find one, but I wanted to verify.) Today I received a "deleted without being read" response from him. Seems like someone's not keeping up with their editorial responsibilities...or their correspondence!